Never one to miss and opportunity to get another stamp in his passport, Rand arranged for a 3 day stop over in Taipei on our one-way flight to Singapore. We came mostly to eat, but saw some sights as well. 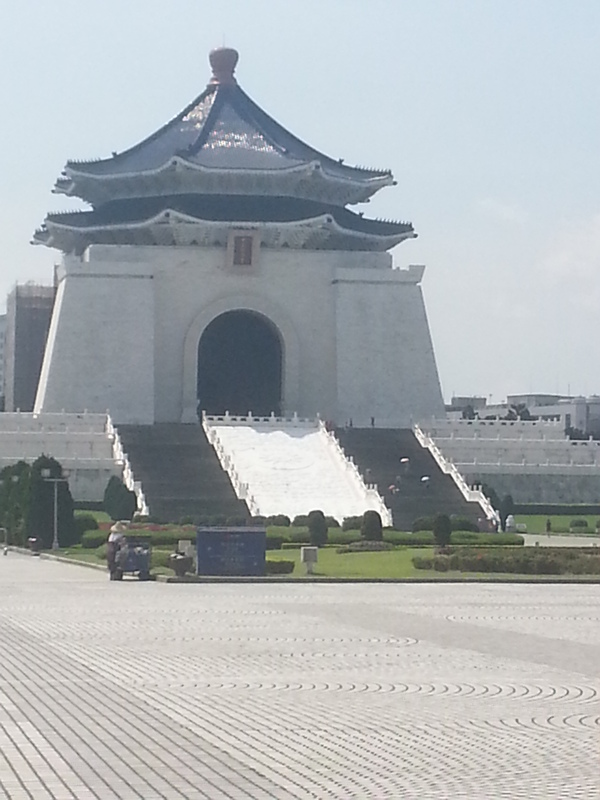 On the first day, we visited the Chiang Kai-shek Memorial. The buildings were interesting, but the weather was so hot and much of the memorial lacked shade. We called it The Square Desert. Walking across the bright, white pavement to the different buildings made us feel like we were melting, especially since we made the mistake of not changing out of the jeans that we had been wearing on our overnight flight. We also visited the Taipei Zoo. 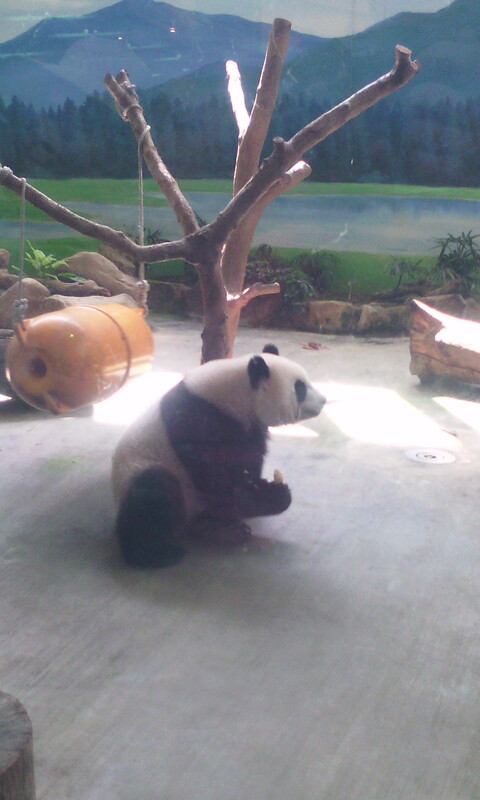 It’s not a great zoo, but it has pandas, which our middle daughter loves. It’s also super cheap (about US $2/person). 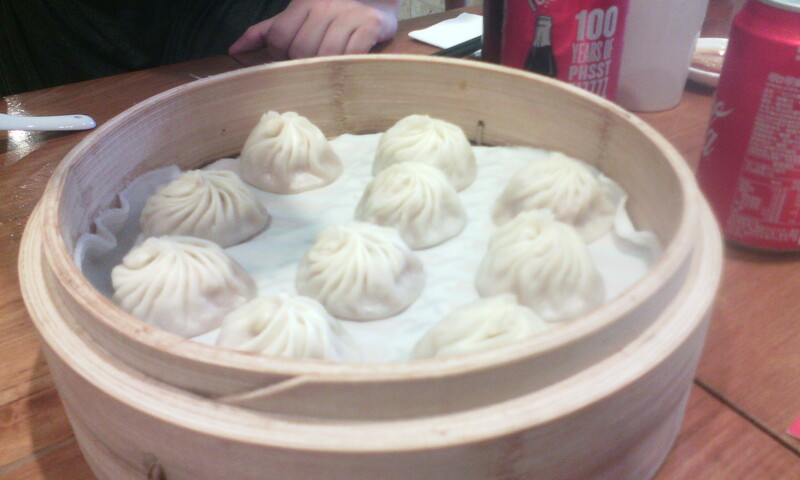 We went to Taipei 101 primarily to eat the famous Xiao Long Bao at Din Tai Fung. Taipei 101 is a cool building in an otherwise pretty ugly city. Our favorite thing to do when traveling is to eat. Sometimes seeing the sights is just a way to kill time until our next meal. Taipei is know for its Xiao Long Bao, so we had to try those the first day. 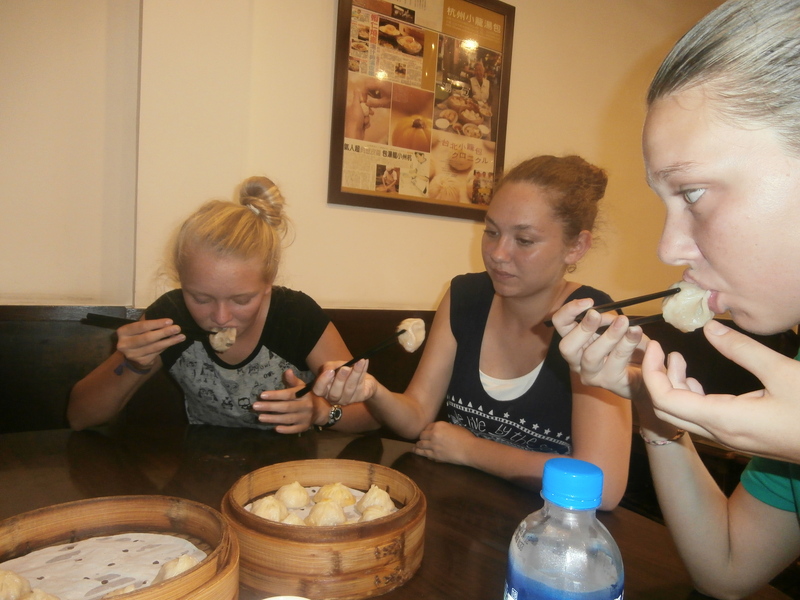 We went to Hangzhou Xiao Long Biao and their soup dumplings were fantastic. As good if not better than Din Tai Fun. Soup dumplings are like regular Chinese dumplings, steamed wrappers filled with meat and vegetables, but also with broth inside. You bite a hole in the wrapper and slurp out the soup, then eat the dumpling. It’s a bit tricky to slurp the soup without the soup spilling all over the table. I only had one out of five attempts be really successful. I highly recommended holding the spoon under the dumpling so you don’t loose any of the delicious, delicious broth. 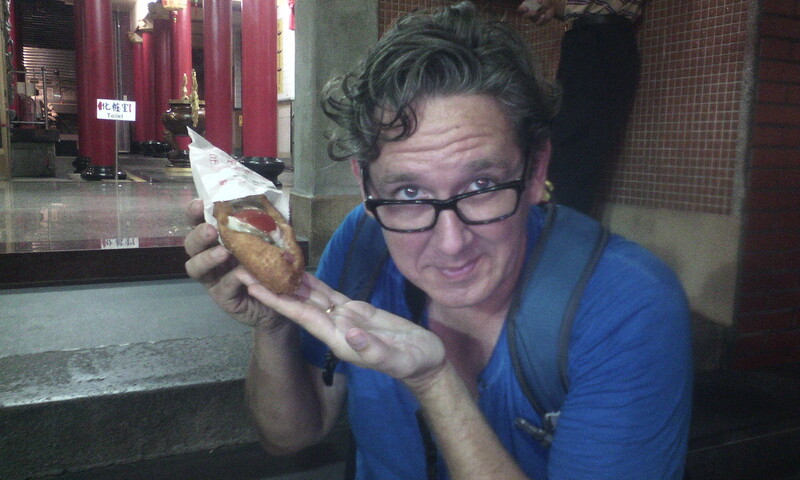 At the Raohe Night Market our favorite was the crispy pepper bun. We took the train out to Keelung to go to the night market. We got the “nutritious sandwich.” It was pretty good, but wasn’t worth the hour long train ride out there. The one bite sausages at the night market were really good though. Rand showing off the nutrious sandwich. It had vegetables, an egg, some kind of meat, and sweet mayo on it. 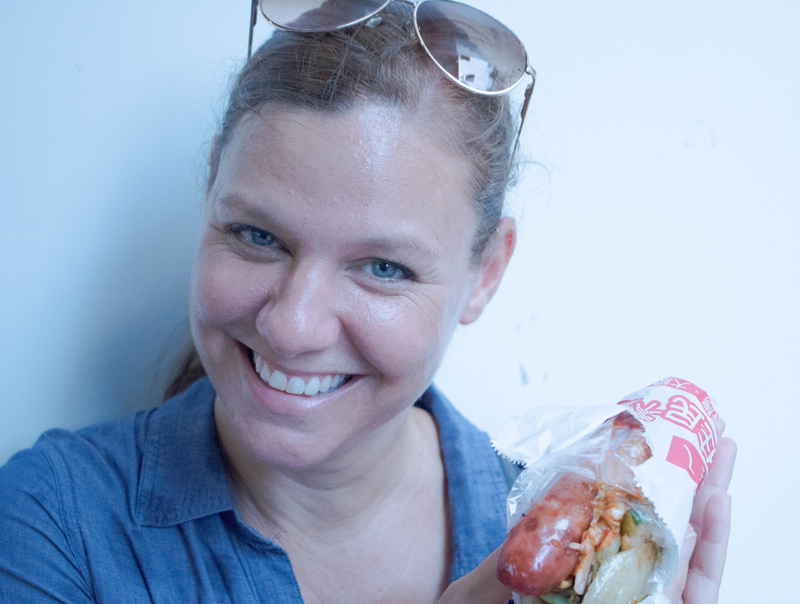 In Xi Men Ding neighborhood we got “little sausage in big sausage” which was probably my favorite thing we ate in Taipei besides the soup dumplings. 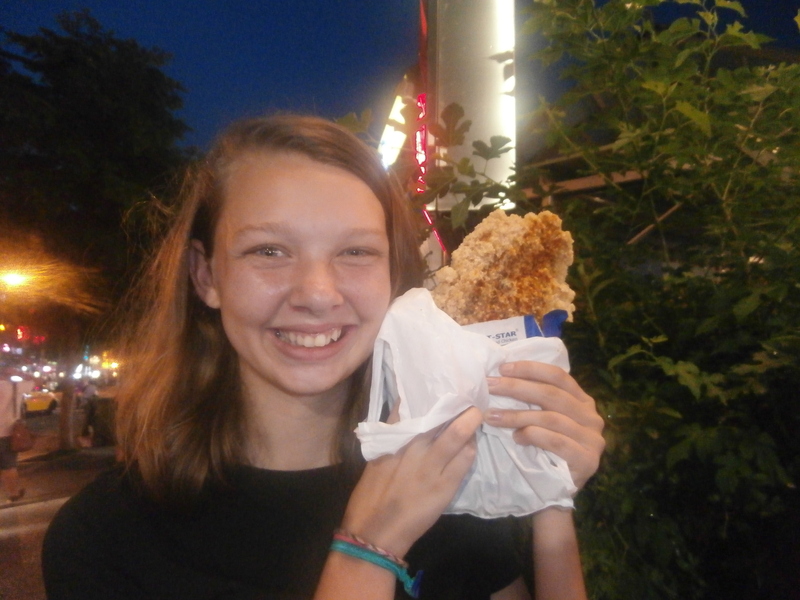 Another favorite was Hot Star’s “large chicken”, a pounded flat and breaded piece of chicken. You need to several people to share this with or you won’t be hungry for the rest of the day. The “large chicken” is as big as Kitten’s head. 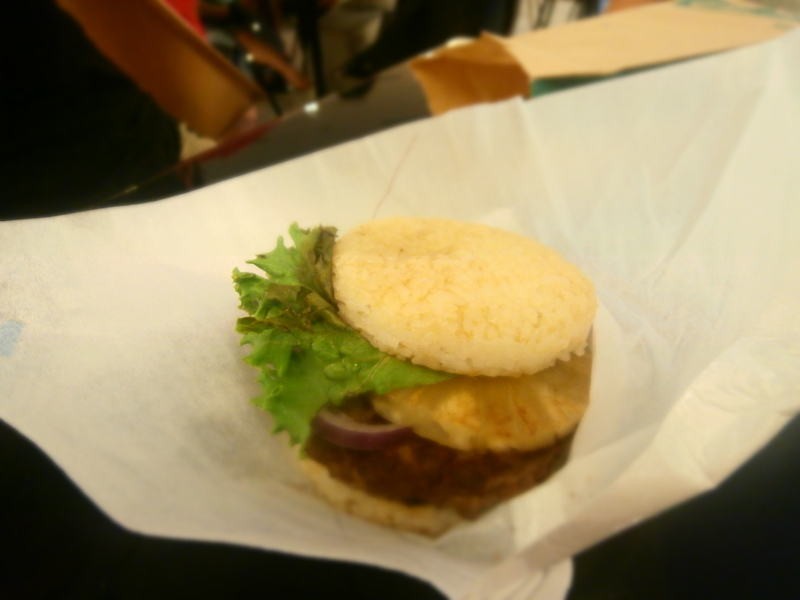 We happened upon a Mos Burger in Taipei 101 and were surprised by how good a hamburger in a rice bun could be. 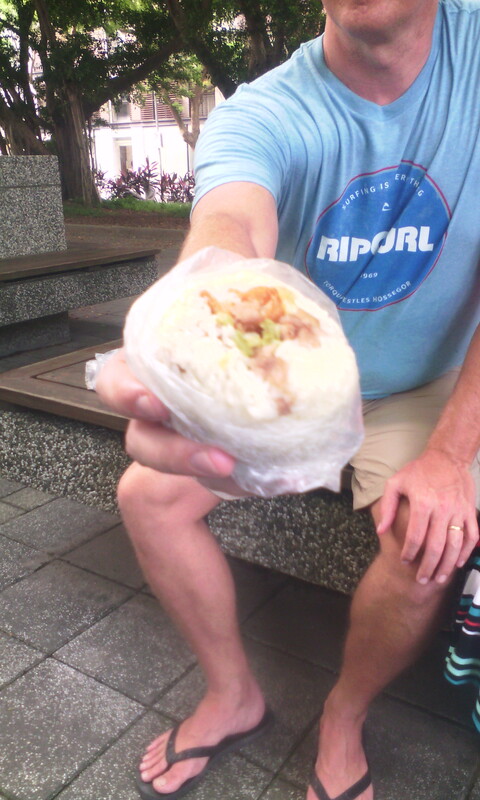 Also, delicious was a breakfast dish of pork and other stuff packed into a rice ball. We stayed at the Taipei Hostel, which provide a sparse, clean room in a great location (just a block from the Shando Temple MRT stop). It cost about US$ 70/night, which was tough on our US$100/day budget, but seem to be a good deal for Taipei. The only issue we had was the internet wasn’t always working or was slow. Also, they only turn the A/C on from 10pm to 10am. Which wasn’t too bad after the first day because room stayed cool with the door closed all day after we ran the A/C all night. For our 3 days in Taipei, we spent about US$400. This is slightly over our goal of US$100/per day. The hotel at US$70/day made it hard to stay in budget. Transportation included US$30 total for bus tickets to and from the airport and US$40 total for the 5 of us for subway passes. US$10 total for the zoo. The rest or about US$100 was spent on food and drinks. Eating mostly street food kept this total low, but it was very hot, so we bought lots and lots of water from 7-11. We enjoyed our time in Taipei even though it was very hot and we were jet lagged. It’s not the prettiest city I’ve been to. In fact, it may be the ugliest. Besides Taipei 101, the buildings are pretty plain or worn down and decrepted. But the city is surprisingly clean and the people are really friendly. And the food is pretty great. Thanks for sharing. Although I can’t taste the food, your blog allows me to travel vicariously through your family’s adventures. The pictures are awesome! Stay safe and may your continued travels be awesome. I look forward to your next post. Tell Rand that I said hello. I agree, what a fun adventure, thanks for virtually taking us long!